It’s kind of amazing that I have managed to evade the Pirates of the Caribbean series over the years. It wasn’t until recently (say, in the last couple years) that I was even aware of the theme park ride that served as Curse of the Black Pearl‘s inspiration. Nowadays, it’s not inconceivable to make an enjoyable film based on something so shallow (i.e. The Lego Movie), but I imagine it was quite the surprise back then. 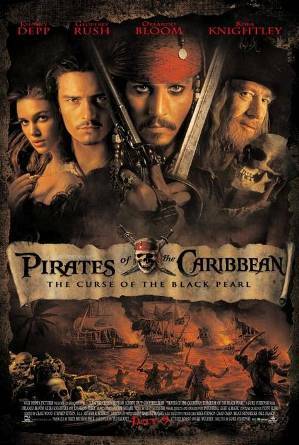 In a nutshell, Curse of the Black Pearl is a huge budget adventure flick that relies heavily on its uniquely strange — and charismatic — lead, Jack Sparrow (Johnny Depp). There’s no denying Sparrow is a great character, and Depp delivers a performance so likable that it inspired him to basically play (mostly uninspired) variations of this for the next several years. Geoffrey Rush matches him step-for-step in the form of the villainous Barbossa, and the two of them make for quite the pairing. Orlando Bloom and Keira Knightley also play pivotal characters, but they are far less interesting. When neither Sparrow nor Barbossa are on screen, the film suffers slightly. 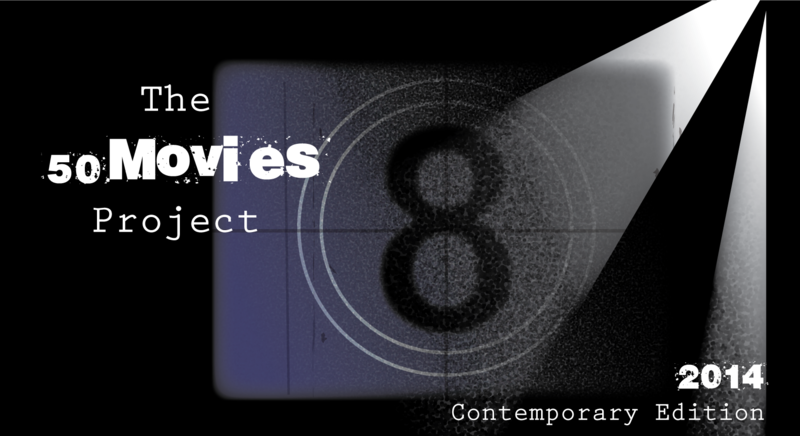 Whereas Pirates of the Caribbean is a fantastical adventure with skeleton pirates and an eccentric hero, Master and Commander comes across as authentic as it gets. While I don’t know a starboard from a poop deck, I was continually impressed with how this Peter Weir feature doesn’t dumb down its content for the audience. The very first scene throws us right into the middle of the Napoleonic Wars, with Captain Jack Aubrey (Russell Crowe) and his HMS Surprise being ambushed by a French privateer ship that is significantly larger in size. It isn’t until the battle scene is over that the film sheds some light on what we just saw, thanks to some dialogue between Aubrey and others on the ship. Even then, the conversation feels natural, and not forced to enlighten us as viewers. It’s this sense of realism that really impressed me with the film. Crowe makes Aubrey out to be a great leader, but not one without flaws. He is kept partly in check via his friend and ship doctor, Stephen Maturin (Paul Bettany), a man who finds respite in the form of species observation and collecting. They provide a good balance for each other, with the doctor being the more levelheaded of the two. If you’re still hungry for more movies set at sea, Mutiny on the Bounty (1935) is pretty good, at least I thought so and rated it 8/10 this month. Haha I know what you mean… Master and Commander is a pretty remarkable piece of filmmaking. I can definitely see why it won the Oscar for Best Cinematography. Thanks for the tip on Mutiny on the Bounty! I’ve added it to my list. I’m skipping over the M&C review since that’s still on my to-see list (maybe before the end of the year? I do own the thing, after all). But PotC is one of my favorites. I’ll agree that it’s at its best when Sparrow and/or Barbossa are on screen, even if Sparrow is really a dominant sidekick rather than a true protagonist. And I like the fact that it went a bit darker than might be expected for a Disney production; I don’t think it would have worked as well without it. Hey Morgan, great to see you around. My girlfriend has been pushing me to check out the sequels, so I may give them a shot when I’m looking for something big and mindless. Can’t say I have high expectations though, especially after your comments. Hope you enjoy M&C as much as I did! 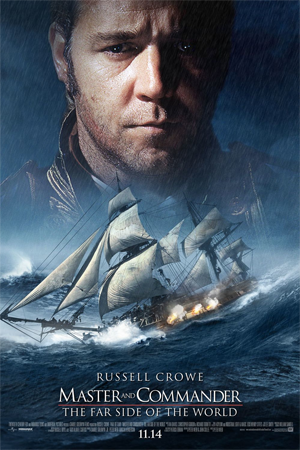 Excellent work on ‘Master & Commander’, Still one of the best maritime films around. Long before steam or powered engines. Enhanced by the small size of the frigate, Surprise. And the crew working like mad when retreat is desired to make repairs. Before returning to pursuit. Which is really the only game in town. Excellent cast led by Crowe and Bettany. Who are equally driven. Though in different ways! Still like ‘Captain Horatio Hornblower’ and the recent, imported ‘Hornblower’ series. Though, ‘Mutiny on the Bounty’ with Charles Laughton ad Bligh works exceptionally well. Hey Jack, great to hear you are a big fan of Master and Commander. I wasn’t sure what to expect, but I was really impressed with its authenticity, and the cast is about as good as it gets. Sounds like I really need to check out Mutiny on the Bounty — Chris also recommended it in a comment above.